Four interesting screenshots of the game World of Warcraft, updated with the patch 3.3.5, were posted at the forums of 3dfxzone.it by the member voodoo3user999. The hardware and software configuration used for the gaming is composed by a VSA-100 based video card like the 3dfx Voodoo4 4500 AGP, and then by a cpu AMD Athlon XP running at 1.65Ghz, and by 1GB of RAM. These devices were coupled with the Operative System Microsoft Windows XP updated with the latest Service Pack 3.
voodoo3user999 installed the SFFT 1.5 driver for its VSA-100 card (you can download the latest SFFT driver here), while World of Warcraft 3.3.5 was running in Direct X graphics mode at a video resolution of 720 x 576 pixel (this one is a low value but useful for the improvement of frame rate). 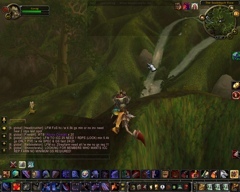 According to the player, with the graphics settings used World of Warcraft didn't showed glitches or similar bugs, resulting playable also in combat scenes. 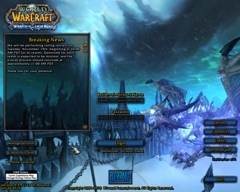 Sono stati pubblicati presso la Community in lingua inglese di 3dfxzone.it quattro interessanti screenshot del game World of Warcraft, aggiornato con la patch 3.3.5, dal member voodoo3user999. La configurazione hardware e software utilizzata per l'esecuzione del gioco è composta da una scheda grafica 3dfx Voodoo4 4500 AGP, da una cpu AMD Athlon XP operante a 1.65Ghz e da 1GB di RAM. Il Sistema Operativo abbinato a tali componenti è Microsoft Windows XP aggiornato con il Service Pack 3. Per la configurazione della scheda video di 3dfx voodoo3user999 ha installato il driver SFFT 1.5 (ricordiamo che la versione più recente del driver SFFT è scaricabile qui) ed ha impostato la risoluzione video di 720 x 576 pixel al fine di ottenere sempre un frame rate tale da assicurare la giocabilità del titolo. 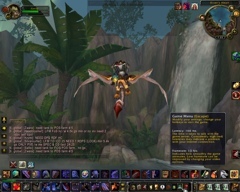 In accordo al player, World of Warcraft 3.3.5 non ha manifestato errori grafici o altri bug, risultando sempre giocabile, anche nelle scene più complesse, come quelle che includono il combattimento.